The Rosary, "rosarium" in Latin, means "garland of roses", and is prayed in honor of the Virgin Mary, since the rose is one of the flowers that symbolizes her. A set of specific prayers, the rosary begins with introductory prayers. Between those prayers and the closing prayer of the rosary are what is known as the decades. Each decade consists of the Lord's Prayer, 10 prayers of "Hail Mary...", and a single "Glory be to the Father". A meditation of one of the "Mysteries of the Rosary" (there are fifteen Mysteries, each of which recalls an aspect of the life of Christ) accompanies each decade. For most people, "praying the rosary", consists of praying five decades. To help those who pray the rosary keep count of their prayers, rosary beads ~ in necklace, bracelet or ring form, are used. 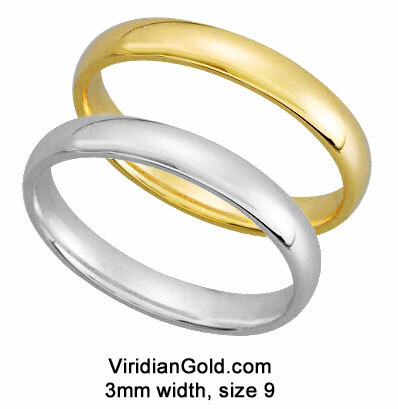 At Viridian Gold, we have a sampling of all these. 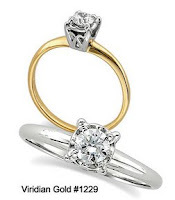 Each of our Rosary Rings is available in 14K yellow or white gold, 10K yellow, and sterling silver. Some of our customer favorites are our Rosary Ring #1010, which is available in two different millimeter widths, 2.5mm and 4mm, and our 5mm Rosary Ring #1059. Or you can view all of our Rosary Rings in Gold and Sterling Silver. Each ring is designed with braille-like prayer beads and a single, small cross on the band, representing one decade of the rosary. All rings can be custom sized. Our rosary beads are for five-decade rosaries, and are available in sterling silver and 14K gold in a variety of styles, lengths and gemstones. Take, for instance, our 22" Hematite Rosary #2077, or a beautiful, 43" Pink Freshwater Pearl Rosary #2023. Both are fashioned with polished sterling silver and genuine gemstones, and most styles are suitable for both men and women. 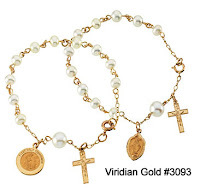 We also offer a sampling of bracelets, such as the one pictured at the beginning of this blog, Pearl Rosary Bracelet #3093. This is for a single decade rosary, and is designed with 14K gold and pearl prayer beads; it comes with a crucifix and either a miraculous or a communion medal. If you are looking for one in sterling silver, we carry rosary wraps, such as our Gemstone Rosary Wrap Bracelet #3090. This is a five-decade bracelet that includes a sterling silver crucifix and a miraculous medal. It is available with black onyx, rose quartz, or mother of pearl prayer beads. For further browsing, see our Religious Bracelets.